Chickweed (Stellaria media) is a delicious and nutrient-dense plant that, luckily for us, grows like a weed. While chickweed is native to Europe, it has spread to many temperate parts of the world and is naturalized in North America. Chickweed loves cooler weather and is often one of the first plants to emerge in the spring. It disappears with the heat of the summer, and in some climates, returns in the cooler fall months. There’s a long list of ways that chickweed can be used as an herbal remedy, but one of the best ways to use chickweed is to soothe and cool conditions that are hot and dry. Do you have an itchy inflamed skin condition such as a rash? Try using a chickweed salve or poultice, as well as using it internally to bring cooling relief. Do your lungs feel hot and irritated and you have a dry cough? Try a tincture or tea of chickweed to moisten and soothe the lungs. Want a nourishing green food that takes seconds to harvest and tastes delicious? Try a chickweed salad or chickweed pesto. Chickweed is a versatile plant! In this article I’m going to explain how to identify chickweed and how to make a super strong chickweed salve that you can use for hot, itchy, and inflamed skin issues, such as rashes, clean wounds, and bug bites. Chickweed is a low growing herbaceous plant that, in the right conditions, forms a thick mat along the ground. It thrives in cool and moist conditions and grows readily in disturbed soil. When I lived in the Seattle area, I often found it growing on organic farms and the farmers were more than happy for me to weed harvest for them. Chickweed’s small white flowers look like they have ten petals, but they technically only have five petals with a deep divide in each petal. Chickweed flowers are said to look like a star. The genus name, Stellaria, means star-like. The leaves are oval shaped and grow opposite along the stem. However, the best distinguishing trait of chickweed is something you may need a magnifying glass or botanical loupe to see. Take a very close look at the stem of chickweed and you’ll see a row of tiny hairs that grow along one side of the stem. With each leaf node, the row of hairs shifts to the next side of the stem. Hopefully these botanical traits can help you to identify chickweed. Remember to always be 100% positive about a plant before you use it internally or externally. If you have any questions about the identity of a plant, find someone local who can positively ID your plant. Chickweed is best used when it’s still young. Harvest it before it flowers, or just as it is coming into bloom. Chickweed that has gone to seed may be too tough or stringy to be enjoyable to eat. Chickweed has easily disturbed roots, so the best way to harvest the plant is with scissors. Simply cut several inches from the top, leaving enough stems and leaves for the plant to continue growing. Chickweed will grow back with a flourish after each harvest! Chickweed is a very moist plant, which means it has a high water content when it’s fresh. Infusing herbs with a high water content into oil can add water to the oil, making your oil or salve more easily go rancid, or even moldy. In order to have the best chickweed salve, we need to dry the plants a bit. However, here’s the tricky part, chickweed is best when fresh. The conundrum! Here’s what I do with plants that are best used fresh when I need to reduce the high moisture content. First, I harvest the plant and let it wilt overnight. The plant material will lose a lot of its moisture, but it won’t be totally dry. Then I use the warm oil method for extracting the plant into the oil. This gently heated process will help to drive off any remaining moisture that might spoil the oil. The recipe below includes my step-by-step instructions. This is a super strong salve made with a delicate plant that brings soothing relief to hot and dry tissues. Consider this chickweed salve for bug bites, hot rashes, clean wounds, diaper rash, or any itchy skin conditions. The optional lavender (Lavandula angustifolia) essential oil is also wonderful for the same conditions, gives the salve a nice scent, and mildly helps to preserve the salve. This recipe makes a soft salve. If you anticipate storing this in a warm location, add more beeswax to help it solidify more. Up to 2 ounces (56 grams) of beeswax can be used in total. Prep the day before: Chop the fresh chickweed finely and arrange it into a thin layer on a cutting board or cookie sheet. Allow to wilt for 12-24 hours. The next day: Measure out 1 1/4 cups olive oil in a measuring cup. Add the wilted chickweed to the olive oil. You’ll get the best results if there is roughly an equal amount of chickweed to olive oil, meaning that when you combine the two, there isn’t a lot of extra oil compared to chickweed or vice versa. 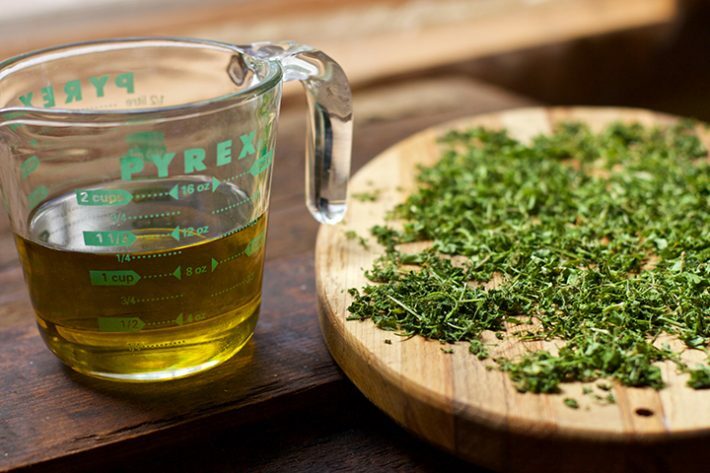 Place the chickweed and olive oil mixture in the top part of a double boiler, or place a bowl on top of a pan that has 2 inches of water in it (the water should not touch the bottom of the bowl). Bring the water to a boil and then reduce to a simmer. Stir the oil occasionally and continue until the oil is quite warm to the touch. Turn off the heat and allow the mixture to sit for several hours. Repeat this process (reheating and allowing to cool) several times within a 24- to 48-hour period to fully extract the plant material into the oil. Throughout this process, do not let the oil get so hot that it smokes or that the plant material begins to “fry” and get crispy – you only need to get the oil warm to extract the goodness in the plant material. When the chickweed has infused well with the oil, the oil will have taken on green color. After 24-48 hours, strain off the chickweed through a double layer of cheese cloth. Measure your beeswax by weight. Using a double boiler or in a pan on very low heat, melt the beeswax. Tip: the smaller your beeswax, the easier it will melt. Once the beeswax is liquid, add the chickweed oil. Stir well to combine, using as little heat as possible. Add the optional lavender essential oil. Immediately pour into tins or glass jars. Let the salve cool until it hardens. Label and store in a cool place. This salve will last for a year, if not longer. Clean-up tip: Use a paper towel to wipe out the pan you used to make the salve while the pan is still warm. Wipe out as much as possible, then wash with hot soapy water. Excellent information on Chickweed, I have never used it alone as a Chickweed salve, but I am going to make some this spring. THANK YOU FOR THE INFORMATION!! Could you use a slow cooker with lid off or place the oil & chickweed on a electric hot pad in place of doing it with the 2 kettles & heating & cooling method? This was my question as well about the crockpot. have you ever use the crock pot? because I often don’t pay attention, or don’t want to, or can’t, it’s so much easier to plug in the Crock-Pot and then unplug it many times a day. if I leave it on and forget about it nothing bad’s going to happen. if I unplug it it’s going to keep oil warm still doing its gentle work. about keeping bugs and stuff out- I use cheesecloth over the top because of course she wants moisture to escape. I don’t believe that you said to leave the lid off. People need to know that -you have to say that so they’ll know keep the lid off -the point is to lose some moisture so your salve does not grow mold and to accomplish this you gotta let moisture escape. I’m sure there are many different ways to heat up the oil. I live off the grid and don’t have very much electricity and can’t use heating pads or crock pots. Basically you want to heat the oil without over heating it. I’ve never taken a temperature reading so I don’t precisely know what that is. If you are using olive oil it will be fairly heat stable. I just looked in the Herbal Medicine-Maker’s Handbook by James Green and he recommends 100 degrees F.
I make this every year. about 1/2 quart worth. my kids love using it, and knowing where it comes from. Most of our herbal monographs on HerbMentor.com contain this very information! Great job as always Rosalee! I’ve spent years hating chickweed invading my garden until I learned its growing there for a reason. I can’t wait to make this oil and salve!! Thank you so very much for sharing such a wonder recipe! I’ve been using a chickweed salve that I bought. I will be making my own now. Instead of turning the heat on and off several times is there an ideal maceration temperature, and if so how long should it be held? I have the ability to hold liquid at a precise temperature for as long as I like (sous vide water bath with mason jars holding the oil). I just looked in James Green’s book on Medicine Making and he recommends 100 degrees. I’m wondering if you could use dried chickweed for this, if you have no access to fresh. If the dried chickweed is vibrantly green and smells like chickweed then I would give it a go. If it’s brown/yellow then I wouldn’t. Basically, chickweed loses its virtues fairly fast once it’s been dried. I mix my chick weed and oil in half pint jars and put them in a yogurt maker for 24 hrs. Works like a charm for making all kinds of salves, especially those with a coconut oil based. Oh I love this one- use an incubator wherever possible! Great! I will try. Thanks. Barry again, I looked at my post, don’t know if I finished it, got interrupted. Is the whole plant (for lack of a better word) nutritious. Check out my web site. My patented skin cleanser is made from 89% dry plant fibers. Barry Chandler, is the entire chickweed plant full of nurishing skin care stuff? What if it’s dehydrated, ground into a fine powder. I realize it is not as potent as fresh, however the product I’m adding it is a dry powder. I love the additional info on Chickweed. I used to fight this “weed” every spring in my garden, until I became familiar with it as a useful herb. Your posts are so wonderful, and cover all the basis! I live in an urban setting now, but I am hoping to find some chickweed to make this wonderful sounding salve. Thank you, thank you. Thankyou so much. Very thorough info and pictures for which I’m grateful. The only other question I have is what part of the U.S. is chickweed usually found? i’m in central texas and haven’t seen it. Maybe I’m just not looking in the right place? I’m in North East TX and we have a lot of “mouse ear chickweed” here. It’s leaves look fuzzy compared to regular chickweed so maybe you can find that variety. My understanding is that it works the same as regular chickweed. You can also look at foragingtexas(.)com. They have great pics to identify all sorts of plants and they show which counties of TX are known to have a particular plant. Thank you Rosalee,wonderful information you are giving us!! I have used chickweed in pesto,and salads and love to learn more ways of using it. Chickweed, purslane, plantain and tender dandelion leaves make great salads with whipped citrus juice and coconut oil dressing. I’ve never tried cooking chickweed, but purslane (washed well to remove all sand) and chopped fine is good as part of a mustard crust for roast beef or mixed into meatloaf. Adds a gentle tartiness, like lemon grass. Where do I look for tins in which to store chickweed salve? I would try the dollar stores. I love coconut & lemongrass together so I will be trying your salad dressing. Thanks!!! I use quarter pint canning jars to put balms in. Walmart sells little white plastic lids for canning jars and they are also in the canning section. We’ve been eating chickweed in bean dip, etc. Have been using it in green drinks for breakfast–it grows all winter in central Arkansas. Spring has sprung here & chickweed growth is exploding! Love it! Started learning about wild edibles/medicinals in April, 2015. So much to do; so little time…. Thanks for sharing about chickweed salve! you can use Candelilla Wax instead of beeswax. If collecting in London make sure it’s away from roads or weedspraying parks, and train lines, all would pollute it and do as much harm as good! I have made a strong chickweed tea that I used as a wash for my boys when they had chicken pox to help relieve the itching and speed healing. Last year I made a salve with chick weed, comfrey and plantain and love it. This year I will try chick weed alone. Love your posts! Oh, my, it appears that this weed I spend a lot of time pulling/raking and discarding might be something useful after all. I can’t believe it…all this time! I am going to take a sample to the local ag agent, to be sure, but I think I have this growing in large amounts all over my yard, even in my pots on my deck. If so, then what a blessing this post is for me :) Thanks! Love your stuff Rosalee! I’ve learned so much thru you and John the last few years. Thanks so much! Rosalee, these pictures, information about chickweed is wonderful, and I can’t wait to make the salve. I haven’t made salve in around 10 years. I have comfrey and plantain growing in my garden, and I am wondering about using those with the chickweed to make salve. I know that would change the outcome of the salve, but as long as I am not contradicting the action of the chickweed, I guess it would be ok. I know that plantain has a drawing out action. Can you say if you think it would change the action of the chickweed salve in a negative way, like working against each other (chickweed vs. adding Plantain and Comfrey to it also?). And also, how can I get the recipe for the chickweed pesto that was mentioned in this post? Can you give a link please? That sounds like a great combination. Several comments about fighting this plant as a weed. In most cases it should not be thought of as a weed but a cover crop. because it is not heat tolerant it generally dies back by the time most garden vegetables are planted or transplanted. It serves the function of feeding soil organisms in the cold wet spring. If it forms a solid mat on bare soil it can shade out more problematic weed seeds. If it is causing a problem then remove it at the first sine of blossoms, because it sets seed very quickly, and add it to your compost or worm bin. To retain it as a mulch layer cover it with glass or clear plastic to solar cook it. In our 4-H gardens in the 1950’s we used a horse drawn spring tooth harrow to roll it to one end of the garden where it composted into mounds for planting our winter squash. Why is it not good if leaves get crunchy? I am curious because I have made many herbal oils and sometimes the herb gets crunchy while warming in oven. Does that hurt the infusion? Can you use dry chickweed if you cannot find it in the wild; or any other recommendations? Does this grow as creeper on top of grass? Comes up easily w rake or just by hand . I had a lot of something on my lawn in Arkansas. I’m not sure. I’ve never seen it grow on top of grass. I would use the plant ID tips I gave in this article to see if it matches the plant in question. Just harvested chickweed with the intention of putting in smoothies. Now I have a great salve recipe. Love the tip on preparing herbs with high water content. Thank you Rosales for the recipe for the chickweed salve. Can one place herb on dehydrator overnight? My question is about water content causing mold. I figured out a way to add aloe to my plantain salve. I make sure both the oil and aloe are the same warm temperature and then whip with an electric mixer the entire time it is cooling. It stays mixed and turns out fluffy. I have never seen any mold in it. Do you think this would work for chickweed salve also? I’m guessing it would. Sounds like a great idea. Update: To make a test batch, I reduced your ingredients by half and added 3 tablespoons aloe vera liquid. Turned out very creamy. And I have already used it on a rash. It relieved the itch right away!! I’ll continue watching for mold though. Thank you so much!! Thank you so much for the info. I have used chickweed salve for many years, as an anti itch cream for bug bites, hives and eczema. I have also used it on animals and found out it was a great salve for festering wounds. We use an incredible amount of it in my family! can you use chickweed for itchy head eczema? I assume you could, although it’s not something I’ve done. I probably wouldn’t choose a salve though – it would be really messy. I lovingly gathered fresh chickweed and made the salve over the past two days. I applied to my entire body after showering. Heavenly. My body loves this salve!!!! wonderful use of this abundant plant and all the comments are so helpful, thanks all! Got some chopped and drying ready for tomorrow’s oil bath :) I have scads of henbit growing alongside the chickweed. Can that be incorporated in this salve? Have you ever tried using coconut oil instead of olive oil to make this or any salve? I unfortunately run into the problem of not using my slaves before they turn rancid, am I doing wrong? I like to add a bit of cottonwood oil to my salves and creams. I find this helps to prolong their shelf-life. If it’s fairly fresh olive oil it should last a year before going rancid. If I am not able to find fresh Chickweed, can I use dried Chickweed for the recipe above? If so, how much dried would I use to make this recipe? Thank you for all of the information above! In Kansas our chickweed flower is purple, is it the same chickweed you are referring to? There are many similar species of Stellaria. This particular plant, Stellaria media, does not have purple flowers. I have read that chickweed is also good for ovarian cyst. One book recommends a tincture. Would this salve work as well? Also, could extra virgin coconut oil be substituted for the olive oil? Can I use coconut oil in lieu of olive oil and bees wax? Thank You! I am in Santa Barbara, CA and I believe we are too dry to have chickweed. I am going to check but is there a way to get it (since we don’t have much rain) elsewhere? If my chickweed has already gone to seed, can I still harvest it for use in a salve?